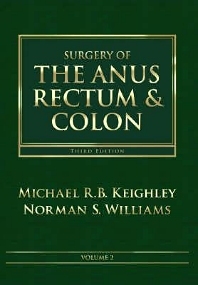 Through two previous editions, this landmark reference has established itself firmly as the definitive resource in colorectal surgery. The third edition continues to redefine the field, with its comprehensive coverage of common and rare colorectal conditions, advances in the molecular biology and genetics of colorectal diseases, new laparoscopic techniques, and more. Contributions from international experts on specialized topics and 400 new illustrations ensure that the extensive text is not only current and authoritative, but easy to understand. No other book provides the expertise of a world-class editorial team with the cutting-edge knowledge you need to master colorectal surgery. Get all the state-of-the-art knowledge you need on common and rare colorectal conditions in one easy-to-read reference. Gain a global perspective on every facet of colorectal surgery with contributions from a "who's who" of American and international experts. Navigate the text quickly with a consistent chapter structure. Better understand operative techniques, imaging, anatomy, and pathology thanks to 5,000 detailed illustrations - 400 new to this edition.